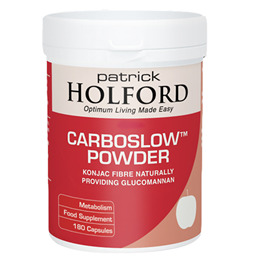 CarboSlow capsules, as recommended by Patrick Holford, contain Konjac fibre. Konjac fibre is a source of glucomannan, a high molecular weight polysaccharide consisting primarily of mannose and glucose sugars. When taken with water it forms a viscous gel that helps to make you feel full after eating. It can be used in combination with a weight loss programme and to support a healthy level of cholesterol, maintain a healthy digestion and support blood sugar balance. Konjac Fibre contains bulking and cleansing properties to support a healthy digestive tract. Konjac Fibre maintains a healthy level of cholesterol. Konjac Fibre supports a healthy level of satiety alongside a weight loss plan. Konjac fibre supports a healthy intestinal environment for the growth of friendly bacteria. Konjac fibre helps maintain a healthy blood sugar balance. Konjac Fibre (Amorphophallus konjac Root) (naturally providing 90% glucomannan), capsule shell (hypromellose), anti-caking agents (magnesium stearate & silicon dioxide). Three capsules taken three times daily with food, or as professionally directed. Always take with plenty of water. Below are reviews of CarboSlow - Konjac Fibre - 180 Capsules - Best before date is 30th June 2019 by bodykind customers. If you have tried this product we'd love to hear what you think so please leave a review. 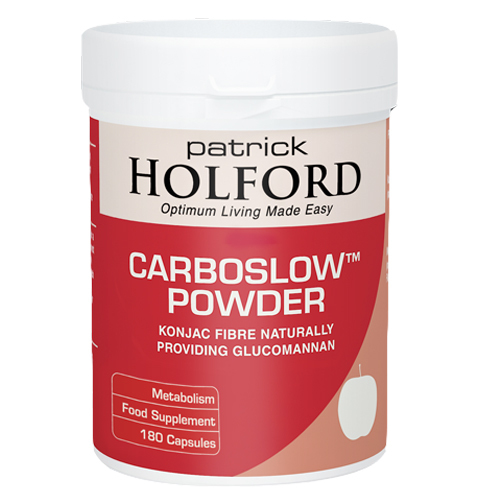 CarboSlow - Konjac Fibre Naturally Providing Glucomannan , as recommended by Patrick Holford, contain Konjac fibre to support metabolism and a healthy cholesterol level.